Greece vs Europe: who will blink first? There is a whiff of 1914 to the latest Balkan showdown. Everybody thinks everybody else is bluffing, all of them betting that a calamitous chain reaction will be averted. In Germany, Der Spiegel reports that Angela Merkel thinks Greece can be ejected safely from the euro, if the rebel Syriza party wins the elections on January 25 and carries out its pledge to tear up Greece’s hated “memorandum” with the EU-IMF “Troika”. The German Chancellor’s team are blanketing the airwaves in what looks like a campaign to drive the threat home. “We are past the days when we still have to rescue Greece,” said Michael Fuchs, the parliamentary leader of Mrs Merkel’s Christian Democrats. “The situation has completely changed. It is entirely different from three years ago when we didn’t have the backstop defences in place. Greece is no longer 'systemically relevant’ for the euro.” He added wickedly that the single currency might actually be stronger without the Balkan troublemaker. It was revealed last week that Germany offered Greece a “friendly” return to the drachma in 2011. Months later, Mrs Merkel was prepared to eject Greece from EMU altogether. Tim Geithner, the former US Treasury Secretary, said the Europeans seemed determined to teach Greece a lesson: “They lied to us, and we’re going to crush them,” was the gist of it. Mrs Merkel retreated only after it became clear that Spain and Italy would be engulfed by contagion if Greece was thrown out. This time, Berlin seems almost eager to finish the job. Yet Syriza’s ice-cool leader, Alexis Tsipras, is equally convinced that the EU elites will back down, knowing that they have invested too much political capital in Greece’s salvation to walk away. After all, the sums involved now are tiny compared to the €245 billion in loans already dispersed since the crisis erupted in May 2010. Surely, after having claimed so confidently that the crisis was essentially over, Mrs Merkel can hardly admit that her strategy has failed? Syriza itself is a neo-Marxist mélange, an ideological work in progress. Mr Tsipras no longer has a picture of Che Guevara in his office and has quickly mastered the Brussels vernacular – so much so that EU leaders and City economists presume, rightly or wrongly, that his rhetoric is just for domestic consumption. Yet the ultra-Left Aristeri Platforma still holds the biggest bloc of votes on Syriza’s central committee, and has stated that the movement must “be ready to implement its progressive programme outside the eurozone” if the EU refuses to yield. Mr Tsipras clearly wants Greece to remain in the euro. But he continues to insist on terms that negate that. He says: “We will cancel austerity. Under a Syriza government Greece will exit the bailout. This is not negotiable.” Twisting his knife into the German psyche, he wants the same level of debt relief – 50 per cent – that Germany secured in 1953, which Greece signed up to despite the death of some 300,000 of its citizens under Nazi occupation. As a result of this crisis, the head of the European Central Bank (ECB), Mario Draghi, is caught in a horrible bind. He is itching to kick off a trillion-euro blast of quantitative easing on January 22 to head off the deflationary forces that threaten to lock the eurozone into a Japanese-style trap. To make any difference, this must entail the purchase of sovereign debt. Yet Mr Draghi can hardly agree to buy Greek bonds three days before the likely election of a party that has vowed to repudiate that same debt. Nor can he exclude Greece’s bonds from the purchases, for to do so would be to pre-empt democracy. The German Bundesbank, and a core of ECB hardliners, are seizing on the unfolding drama in Athens to demand a further delay to QE – a policy that they view as fiscal union by the back door. But meanwhile, the eurozone is tipping into outright deflation, with the oil price crash almost certainly having pushed inflation below zero in December. In normal times, cheap energy would a “positive supply shock” akin to a tax cut. But these are not normal times, says Peter Praet, the ECB’s chief economist. He warns of a “very high risk” that a deflationary psychology will take hold, causing firms and households to delay spending. The lesson of the Thirties is that this ugly dynamic feeds on itself. Deflation makes it ever harder for borrowers to overcome their debts, pushing them further into the compound interest trap. For example, for southern Europe’s crisis states, the debt burden has risen, while nominal GDP remains flat, or has even shrunk. The more they slash spending to balance the books, the more the economy contracts. 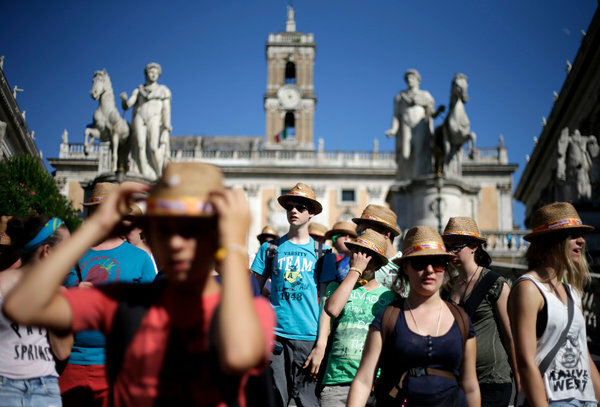 Italy’s debt ratio has spiked from 116 per cent of GDP to 133 per cent, despite austerity and meeting EU deficit rules. The Bank of Italy warns that any further drift towards deflation could have “extremely grave consequences”. The “Latin Bloc” has enough votes within the ECB to force through QE against German resistance. But to do so would be risky at a time when Germany’s anti-euro Alternativ fur Deutschland party is nipping at Mrs Merkel’s heels. The sacred contract of monetary union is that Germany should never be outvoted on critical issues. To breach that would jeopardise German consent for the whole euro project. The crisis may come to a head in March when Greece is due to run out of cash. The ultimate showdown could come in July and August, when Greece must repay €6.7 billion to the ECB. Mr Tsipras’s advisers say he is already braced for a fateful call from Frankfurt threatening to cut off support for Greece’s banking system unless he backs down. Such a move would force Greece out of the euro within days – but Mr Tsipras has told his inner circle that he intends to call the ECB’s bluff, insisting that the verdict of the voters cannot be overturned by “threats of Armageddon”. Nobody disputes that Greece abused its euro membership. What is in dispute is to what degree the northern creditor states were equally complicit in flooding southern Europe with capital before the crisis – and whether austerity overkill has been an unforgivable mistake. The “snowball” effects of the cuts saw a fall in Greek GDP of 25.7 per cent and a youth unemployment rate that peaked at 62 per cent. Austerity failed even to achieve its key goal of reducing debt, which has spiralled to 177 per cent of GDP. The leaked minutes of an IMF board meeting in May 2010 admitted that what took place was not a “rescue”: Greece should have been given debt relief, but was instead sacrificed to save the euro – and the banks. It is the failure of Brussels and Berlin to acknowledge this that makes Greeks so bitter, and this crisis so politically explosive. Berlin still insists that Portugal, Spain and Italy are strong enough to withstand the shock of “Grexit” from the euro, and that the new banking union and new rescue tools stand ready to halt any contagion. But Peter Bofinger, one of Germany’s five “wise men” economists, says this “would let a genie out of the bottle that would be hard to control”. Even as the US is booming, the eurozone is close to a triple dip recession. Output is still below its pre-Lehman peak. Italy’s industrial production is back to levels reached in 1980. Europe’s purported “reforms” have not raised its future growth rate, and therefore its ability to repay debt. Any gains have been overwhelmed by the malign effects of mass unemployment. Markets have been calm about this only because the ECB saved the day in July 2012, pledging – finally – to act as a lender of last resort to Italy and Spain. But Germany’s top court has ruled that this “manifestly violates” EU treaties, so it cannot be done again. Nor does the “banking union” create a proper, pan-EU defence: each state is still responsible for bailing out its own lenders. The worry is that a Greek exit from the euro would rip away the façade that covers all of these problems, exposing the reality that EMU is less economically viable than ever, more indebted than ever, and scarcely a step closer to a genuine fiscal and economic union. Mr Tsipras has his fingers on the pin of a pan-European grenade. Jorge Grave’s future looked bright when he in 2006 graduated with a degree in physical education from the Technical University of Lisbon. But then the eurozone crisis erupted, and sucked Portugal’s economy down the drain. To save money in the resulting austerity drive, school classes were swelled and Mr Grave’s hours as a gym teacher in his native Setúbal were cut to just one a day. Unable to survive on such a pittance, he was forced to quit and set up a personal training business, while many of his former colleagues continue to eke out a living from teaching — or have had to leave education altogether. Portugal limped out of its bailout programme last year, but the economic scars of the crisis are still raw. The widely-watched debt to gross domestic product ratio remains at almost 130 per cent, one of the highest rates in the world. Although borrowing costs have fallen the country now spends more money on simply servicing its debts than on its entire education budget, taking a heavy toll on teachers like Mr Grave. The government has fought hard to restore its credibility with investors, but some economists fret that the country’s debts remain unsustainably high. Portugal’s predicament is a vivid example of a longstanding conundrum of economics: when is a country bankrupt? At what point are a government’s debts simply too great to bear? Unlike for companies, there is no clean answer for countries. Yet rarely before has the question been more pressing, in states from Ukraine to Venezuela, from Jamaica to Ghana and not least in Europe, where a clutch of countries still labour under staggeringly high debt burdens even as the crisis recedes. Despite the biggest restructuring in history in 2012, Greece’s debts are still at about 174 per cent of GDP, a fact that has helped the radical left Syriza party ride high in the polls on a platform of “debt forgiveness” from the country’s lenders ahead of elections later this month. Together with the IMF, the Financial Times has designed an online, interactive tool based on the fund’s economic model that calculates a country’s debt trajectory and how it is affected by an array of factors such as economic growth, borrowing costs and public belt-tightening. Assumptions can be tweaked to see how debts can be tamed, or increased. But it cannot determine exactly when a country is bankrupt. Walter Wriston, the former chairman of Citigroup, once said “countries don’t go bust”. In some respects the banker was right, countries do not go out of business and disappear like companies do. Yet history is littered with examples of governments directly or indirectly reneging on their debts. There are reasons to fear that Smith’s observation might still hold true. The gross government debts of developed countries now stand at an average of 108 per cent of GDP, according to the latest Geneva Report written by a panel of senior economists. Hardly anyone spends more time squinting at the financial ledgers of governments and calculating their sustainability than the staff of the IMF. But even its experts admit it is, at best, a rough science. They operate with a rule of thumb that developed countries should try to keep their debts below 85 per cent of GDP, while emerging economies should aim to stay below 70 per cent. This is corroborated by a considerable body of academic research. In This Time Is Different, the account of humankind’s lamentable confidence in thinking that financial crises are a thing of the past, professors Carmen Reinhart and Kenneth Rogoff calculated that the average external debt-to-GDP ratio of countries that defaulted in 1970-2008 was just 69.3 per cent. This ratio does not include local debts. These have proven less problematic as governments can simply print the money they need to service these liabilities, often leading to inflation but not a direct, “hard” default. Even without debasing the currency, local debts are usually less susceptible to crises, as domestic savers and investors are more willing to fund their government than foreign investors in times of distress. In extreme situations, local savers and investors can be cajoled or forced to do so through regulation, a phenomenon known as “financial repression”. The large pool of local savings is one of the reasons why developed countries such as Japan can typically carry bigger debt burdens than emerging economies without buckling. The FT-IMF interactive model for debt sustainability therefore allows users to tweak the mix of local and foreign debts to see how it can affect a country’s vulnerability, as well as growth, interest rates, currency shocks, the primary budget balance (before interest payments) and borrowing costs. Yet these numbers are only a guide to determining when countries are flirting with disaster, says Reza Baqir, head of the IMF’s debt division. Moreover, history has shown that looking purely at government debts can be misleading. Nominally private debts have a nasty way of becoming public liabilities in severe crises — especially when bloated banking sectors implode and governments feel compelled to bail them out, as happened in Ireland and Spain in the eurozone crisis. Some economists fear the next noxious examples of this phenomenon could crop up in the developing world. While the recent Geneva Report estimated that emerging economies only have an average gross government debt-to-GDP ratio of 48 per cent, add in the private sector and the total climbs to 151 per cent — even excluding the debts of their banks — and rising fast. Defaulting is almost always a political decision. Some countries are able and willing to credibly impose draconian spending cuts and tax rises to repay their debts no matter what the impact on the economy, while others would rather default as soon as a crisis bites. The decision may make little conventional sense. Nicolae Ceausescu’s determination to repay in full and on time $9bn owed by Bucharest to foreign banks in the 1980s forced many Romanians to go through winters with little or no heat, and factories to partly shut down to conserve electricity. On the other side of the spectrum, Ecuador controversially decided that some of its foreign debts were “illegitimate” and defaulted in 2008, despite the absence of any severe stresses. Growth — the simplest solution to excessive debts — cannot be conjured up by magic, and often proves stubbornly elusive when it is needed most. But some countries have pulled off improbable escapes. Turkey, for example, looked doomed to default in the early 2000s. Every IMF warning light was flashing red, and at one point in 2001 a debt auction resulted in an annual interest cost of 130 per cent, recalls Kemal Dervis, then the economy minister. “You’re not very happy on days like that,” he says. Thanks to some nimble footwork by Mr Dervis, a massive bailout from the IMF and a flurry of previously stalled reforms, Ankara managed to pull back from the brink. Within a few years the economy regained its vim and embarked on a long period of expansion. But the former minister, now at the Brookings Institution, admits that the buoyant global economy of the early noughties was a big boon for Turkey’s recovery, a fillip few countries can count on today, especially in the eurozone. Despite falling borrowing costs, the debts of countries such as Greece, Portugal, Spain and Italy continue to mount, with the burden eating into ever more revenues at the cost of public services. For now, investors have faith in eurozone bonds again, but voters may eventually rebel at seeing creditors claim an increasing share of the public purse. Greek voters will have a chance to do so in elections later this month. No one has worked with as many countries in distress as Lee Buchheit, the lawyer virtually every government turns to for advice on restructuring debt when the money runs out. He says the one common factor in every country he has worked for is initial denial. Sovereign debt sustainability has typically been an issue for emerging markets, but economists are training their eyes on the heavily-indebted countries on Europe’s periphery. Borrowing costs have slumped to multiyear or record lows after Mario Draghi, the European Central Bank governor, promised to do “whatever it takes” to keep the currency bloc intact. Yet with inflation extremely subdued and growth anaemic at best, there are mounting concerns that the periphery’s debts are simply unsustainable. Almost 10 cents in every euro of revenues raised by Portugal, Ireland, Italy, Greece and Spain now goes to simply servicing debts, let alone repaying them. Without a growth and inflation spurt, economists Barry Eichengreen and Ugo Panizza have pointed out that for their debt-to-gross domestic product ratios to stabilise, and eventually fall towards the 60 per cent targeted by the EU by 2030, the countries would have to run primary budget surpluses — before interest payments — of between 4 per cent, for Spain, and 7.2 per cent, for Greece. Economists at Barclays fear that the problem is not contained along Europe’s rim. In a report last year they pointed out that the eurozone’s “soft core” — countries such as France, Belgium and even the Netherlands — also confront challenging debt burdens. Policy makers face a dilemma on how to tackle the problem. Deeper austerity would undermine growth and exacerbate debts. Boosting spending may help growth but could also lift debt levels and intensify market concerns. Restructuring debt is tricky when the biggest holders are domestic banks that could be bankrupted by a haircut severe enough to make a difference. Hurts So Good: When Exactly Are Falling Prices Bad? Modern economists have it all upside down. Oil's price fall, like all falling prices, is good not bad. The dichotomy shows what they want, inflation. The sudden fall in the price of oil provides a unique opportunity to examine the widely held belief that deflation is economic poison. As many governments and central banks have vowed to fight deflation at all costs in 2015, the question could hardly be more significant. While falling prices may strike the layman as cause for celebration, economists believe that it can kick off a nasty, and often inescapable, negative cycle, which many believe leads inevitably to a prolonged recession, or even a depression. However, these same economists acknowledge that falling energy prices may offer a stimulus, equivalent to an enormous "tax cut," particularly for lower and middle income consumers for whom energy costs represent a major portion of disposable income. They suggest that the money consumers and businesses no longer spend on gasoline and heating oil could be spent on other goods and services thereby creating demand in other areas of the economy. Even Fed Chair Janet Yellen, a staunch advocate of the economic benefits of rising consumer prices, has extolled the benefits of falling oil prices. After considering these competing tensions, most economists agree that falling energy prices are a net positive for an economy (except for oil exporting countries like Russia and Venezuela). But the fact that there is even a debate is shocking. It should be clear to anyone that consumers individually, and an economy collectively, benefit from lower energy prices. As I mentioned in a column late last month, no one buys energy for energy's sake. We simply use it to do or get the things that we want. The lower the cost of energy, the cheaper and more abundant the things we want become. But if we all can agree that lower energy prices offer a benefit, why can't we make the same conclusion about food prices? Wouldn't consumers get a huge "tax cut" if their grocery bills fell as dramatically? How about health care? Wouldn't we all be better off if our hospital and insurance bills fell dramatically from their currently insane levels? Come to think of it, why wouldn't we be better off if the price of everything fell? When does too much of a good thing become too much? Modern economists tell us that while it's okay for one or two sectors to see price dips, the danger comes when prices decline across the board. Their theory is that if consumers believe that prices will fall over time that they will curtail their purchases to get better deals down the road. Even if the overall dip is relatively small, just 1% annually for example, they believe any amount of deflation will eviscerate demand and kick off a cycle where depressed demand leads to weak sales, which leads to business contraction, layoffs, and further depression in demand thereby renewing the downward cycle. But the truth is that deflation is not the menace to consumers and businesses that governments would like us to believe. Common sense and basic economics tell us that prices fall for two reasons: Either an excess of supply or a lack of demand. In both cases falling prices are helpful, not harmful. For much of our history, increased productivity increased the supply of goods and forced prices lower. Falling prices made former luxuries affordable to the masses, and in so doing made possible the American middle class. Based on data from the Historical Statistics of the United States, the many periods of sustained deflation did not halt American economic growth in the first 150 years of the Republic. (Sustained inflation did not become the normal state of affairs until 1913, when the Federal Reserve was created). Prices can also drop when demand falls due to economic contraction. Any store owner will tell you that if customers stop buying and inventories get too high, the best way to create new demand is to mark down prices. This is basic supply and demand. Demand rises as prices fall. In this sense, falling prices are not the cause of economic contraction, but the market solution to depressed demand. But today's economists are rewriting this fundamental law. In their eyes, demand rises as prices rise. Economists also argue that falling prices will harm business and lead to unemployment. They forget that falling prices also mean falling costs and increased sales, which lead to higher profits, more capital investment, greater production, and higher real wages. Henry Ford succeeded, and his workers prospered, not because he raised prices, but because he lowered them. Cheaper Model T's did not impose a burden on the public or compel Ford to lower wages. More recently, the tech industry has prospered, and has paid its workers well, by consistently lowering prices. As a result of these ideas, economists advocate for policies that push up prices. But all this does is kill off more demand and prolong the slump they are trying to cure. Since Janet Yellen acknowledged the beneficial effects of falling gas prices to consumers, I wonder if she could name even a single category of goods that would impose a burden on consumers if it were to fall in price? My guess is that she can't. If a decline in the price of any individual product is good, then a decline in the price of all products simultaneously is even better. Am I the only one who notices the inconsistency in this logic? Perhaps this disconnect can shed some light on a topic that central bankers are desperately trying to keep hidden in the shadows: Falling consumer prices are good for the consumer and the economy, but they are bad for central banks looking to maintain asset bubbles and for governments looking for a graceful way to renege on their debts. If we continue to insist that falling prices are the cause of economic malaise, we will continue to produce economies where malaise is the only possible outcome. It just might be time to book that vacation in Paris you’ve been thinking about. That is one practical conclusion to draw from a remarkable set of shifts in global currencies that started in the second half of last year and has continued in the early trading days of 2015. The seemingly inexorable rise of the dollar versus the euro and most other currencies has broad implications for the global economy this year and beyond. The euro traded below $1.19 at times on Monday, the lowest level in nine years (it was $1.39 as recently as May). The dollar index, which tracks the dollar against six other major alternatives, is up almost 15 percent since June 30. Those swings are big enough to reshape the terms of economic interaction among the most powerful nations on earth — and will affect almost any company or individual doing business across national borders. The underlying causes are straightforward enough. The United States economy is doing far better than most other advanced countries, achieving a recently revised 5 percent G.D.P. growth in the third quarter. The Federal Reserve is planning to raise interest rates this year, at a time its counterparts in Europe and Japan are pushing toward easier money. But the consequences are quite a bit more varied, some straight from Econ 101 and others unique to the current circumstances. Trouble for U.S. exporters? For American companies that compete globally and derive much of their income from overseas, things have gotten a lot tougher in the last few months. If you are United States-based Boeing competing with European Airbus to sell jumbo jets around the world, or a California winemaker trying to persuade global buyers your product is better than its French and Italian counterparts, your competitiveness has fallen. Firms that must pay workers and buy raw materials in now-depreciated currencies like the euro and yen are effectively getting cost savings even without having to cut pay or renegotiate with suppliers. That said, because the currency appreciation has its roots in an improving domestic economy, American manufacturers are hardly panicking. We’ve heard little complaining — so far at least — from business interests complaining that other countries are engaging in currency wars. “The dollar is strengthening in many ways for the right reasons,” said Chad Moutray, chief economist at the National Association of Manufacturers, “because we’re one of the brighter spots in the world. That said, if the appreciation goes much further, don’t be surprised if U.S. exporters start to pressure the government to apply diplomatic pressure to reverse the slide. A less powerful stimulus from oil price declines overseas. One reason the United States economic expansion is picking up is that plummeting oil prices (and the lower gasoline prices that result) are leaving Americans with more money in their pockets. But oil prices are almost always quoted in dollars, so the dollar appreciation exaggerates somewhat the extent to which oil prices are falling for most people around the world. In Europe, notably, the benchmark price of Brent crude oil has fallen 53 percent when measured in dollars since June 30, but only 46 percent when measured in euros. Cheaper oil will be good for consumers everywhere, but the strong dollar means the shift is sharpest for Americans. Even less U.S. inflation pressure — but a bit of help for Europe and Japan. One of the most intractable realities of the last several years is that inflation has been consistently below the 2 percent that the Federal Reserve and other major central banks aim for. Inflation has been a bit below in the case of the United States (with 1.2 percent inflation in the last reading), and way below in Europe (a mere 0.1 percent in Germany, the government statistics agency said Monday). The rise in the dollar and decline in other currencies will tend to push U.S. inflation down and European and Japanese inflation up. A more expensive dollar will mean cheaper imported goods for Americans, while making imports more expensive for those overseas. While major central banks don’t normally make currency values the explicit focus of their policies, they are supposed to account for whatever impact their fluctuations have on inflation. In that sense, for the European Central Bank and Bank of Japan, the falling currency values could have a welcome effect of helping prices rise a bit faster, at least temporarily. For the Federal Reserve, meanwhile, it could mean even lower inflation and more latitude, should its leaders choose, to wait longer before raising interest rates. A different travel landscape. Americans thinking of traveling overseas are winners in the currency swings. Conversely, travel-related firms that cater to foreigners in the United States are losers. This is really a variation of the point above about a strong dollar creating challenges for exporters, in the sense that a Japanese tourist who visits California and spends $5,000 has pretty much the same impact, in terms of trade and balance of payments effects, as our California winemaker shipping $5,000 worth of wine to Tokyo. But as people make their summer plans, the fact that, for example, European destinations are 12.5 percent cheaper than they were six months ago in dollar terms could both make locations abroad more attractive to Americans and U.S. travel less attractive to would-be foreign visitors. The effect shouldn’t be enormous, argues David Huether, the senior vice president for research at the U.S. Travel Association; their analysis suggests that a 10 percent rise in the dollar should translate into only a 0.2 percent drop in the number of visitors from abroad. “The value of the dollar will have some impact, but I think travel will be less impacted than other goods and services, where a piece of steel is a piece of steel,” said Mr. Huether, arguing that the United States’ distinct offerings are attractive enough that travelers will pay a higher price to visit. Barring a reversal in currencies, 2015 is shaping up to be a year of testing just how high a price they’re willing to pay.